The river forests of the tropical Americas are the home of these large green lizards. These animals grow to bV2 feet in length of which only a foot and a half is the body, the rest being the slender tail. The adults feed on plant material, while the juveniles hunt and eat insects. Adult specimens often bask in high trees along river courses and will jump 1 8 to 20 feet into the water. They are excellent swimmers. The heavy dewlaps, irregular scales, and crest of spines along the back long made this one of Hollywood’s favorite species for depicting prehistoric dragons. 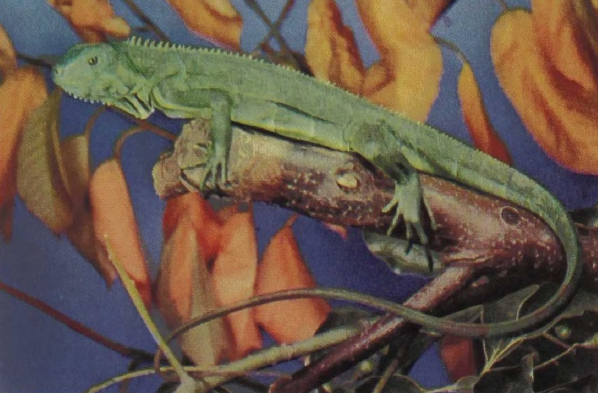 Both the eggs and the flesh of the adult iguana are much prized as food, and in some districts of Central America it may be the most important game animal.